Five of the upcoming cookbook authors who will be featured in the next posts are of national and international reputation but all live locally in the metro DCs area. First and foremost is the queen on Jewish Cooking in America the famed Joan Nathan. Her new book just released Quiches, Kugels, and Couscous: My Search for Jewish Cooking in France (Alfred A. Knopf, 2010). Quiches, Kugels, and Couscous is the acclaimed Joan Nathan's tenth book. Published in 1994, Jewish Cooking in America won the James Beard Award and the IACP and Julia Child Cookbook of the Year Award, among many other accolades. I always revered as I understood how much work goes into this tapestry of recipes but the enormity of the research dawned on me only after watching the trailer (press trailer on right) on Joan Nathan's site. The much discussed Pain Petri (Anise-Flavored Challah With Sesame Seeds) I thought, if you bake few loaves, the day or two old challah will be so perfect as a Thanksgiving stuffing base. The anise flavored challah stuffing will be complemented well with mirepoix. added to the mixture sauteed granny smiths and pear and voila a more festive twist to Thanksgiving stuffing tradition, with the anise flavor fitting well with the traditional Thanksgiving spices and fare. I will be baking the Pain Petri for Friday night dinner tomorrow and saving one to cube and toast for stuffing on Thanksgiving. You can find Washington Post's own @BonnieBenwick's excellent write up on Quiches, Kugels, and Couscous and Joan Nathan's speedy challah here with a link to the Pain Petri (Anise-Flavored Challah With Sesame Seeds) challah recipe among others. Jewish cooking has become mainstream in America, who doesn't love challah and bagels?! Which brings me to @washingtonian's Todd Kliman, Best Bites Blog featuring Joan Nathan's Quiches, Kugels, and Couscous discussion of 'where Bagels Came from' . Bon Appetit also listed Quiches, Kugels, and Couscous as favorite cookbooks of 2010 here. While leafing through the pages I find it fascinating the French Jewish community recipes from both, east and west, Ashkenazi and Sepharadic cultures, stories and recipes included for a wide spectrum of recipes all the way from Eastern Europe to North Africa. I Can't wait to try the artichoke and orange salad with saffron and mint, the Provencal lamb with garlic and olives, Italian plum tart as well as many other recipes from Quiches, Kugels, and Couscous. 1. Please follow on twitter @joan_nathan on twitter. 4. Leave a comment on this post! 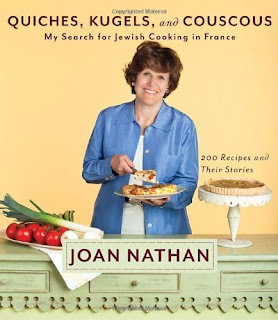 You are encouraged to share a comment about Joan Nathan and Quiches, Kugels, and Couscous or any other thoughts. 5. Drawing will be done randomly from all comments recorded by Thur., Nov.25 at midnight and the lucky winners will be announced Fri., Nov. 26. Disclaimer: I received the review copy of Quiches, Kugels, and Couscous and one extra giveaways copy from Knopf publishing free of charge. I was not solicited neither my opinions nor my review. I make Joan Nathan's matzo balls for Passover every year. She is an icon of Jewish cooking, and I desperately must get a look at that kugel recipe! :-D If I don't get it here, I must have a copy of this one! I am following Joan Nathan on Twitter, too! but seriously, I love Joan's recipes and her stories. No doubt this book is filled with amazing info. Would love this book! Great giveaway and post! Always love reading your site! I've been seeing this book everywhere and would LOVE to have a copy! I always seek out Joan's recipes when a Jewish holiday rolls around. I would love to be able to get better at making great Jewish food in my own kitchen! Quiche, couscous and kugel -- CLASSIC trio if you ask me. Excellent! Cool giveaway! Just followed you on twitter! And I followed Joan Nathan too. And Joan Nathan on twitter too! It's fascinating to look at the history of the Jews and how their cuisine influenced and was influenced by different cultures. Love Joan Nathan's storytelling/history and of course recipes! Can't wait to check out this book! Would love to learn how to make some of my fave foods that are so hard to find outside of the Metro areas. How cool, jewish cooking in France!! Hi there :) Just found your lovely blog & I'm super excited as I know almost nothing of Jewish fare & it sounds with all your travels you've got a bunch of other cultural cuisine in your bag. Love it! Gosh, you made me hungry! I follow you on Twitter. I've RT'ed and "liked" this on Facebook as well. Thanks for hosting this! Following both you and Joan Nathan on Twitter. Looks like a wonderful book! Following both and liking on Facebook!